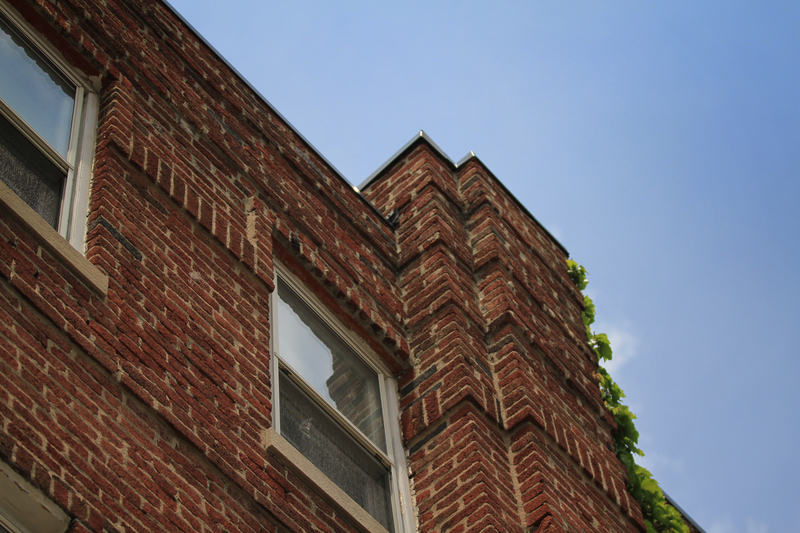 Is it a death sentence for a building if it doesn’t make the National Register? Not always. Continuing with the list of apartments from the last post, the remaining half of the list ends with three buildings standing, two demolished. Listed as the Legacy Flats in the nomination, they were called the Madison Flats up until 1982. The Madison Flats were built on a small triangular strip of land bounded by Madison Avenue, Pennsylvania Street, and Merrill Street. 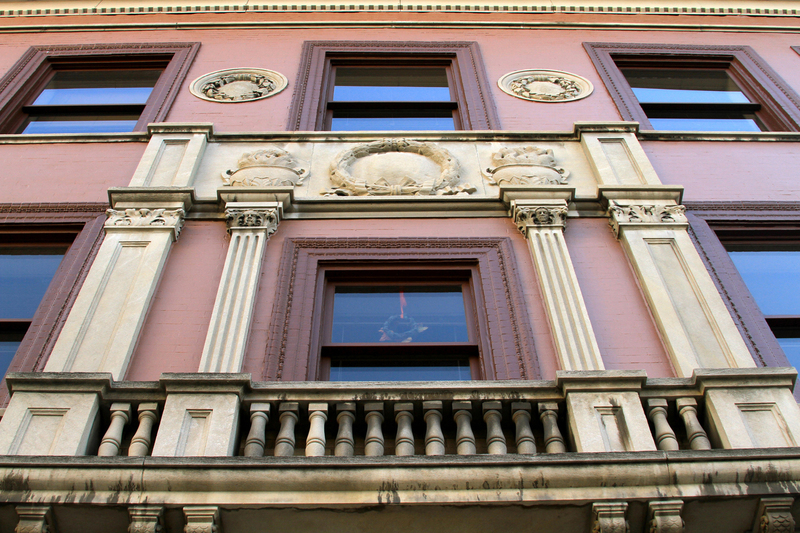 They were built at 607-611 Madison Avenue and 608-616 South Pennsylvania Street in 1908. The explanation for not being included in the nomination was that it “simply lacked the overall quality of architectural design and workmanship needed to be eligible.” (NRHP Nomination Form, 1983) Being directly south of the commercial district of downtown, this area filled up very quickly. Even in 1887, almost every lot was used either by a single family dwelling or a small business. The Jefferson-Madison-Indianapolis Railroad system cut through the neighborhood to the east of the future flats. By 1898, more businesses and warehouses began moving in, as people most likely kept moving further away from the commercial district and settling in other nearby neighborhoods. The future Madison Flats were near the Industrial Training School complex. 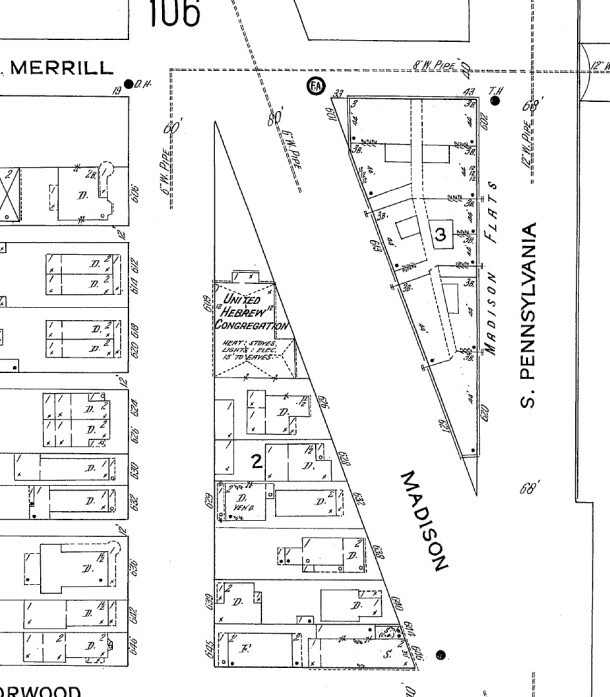 In 1898, this triangular lot was comprised of four smaller single family homes, one duplex, and a small commercial building in the southern point that was a drugstore for a time. The fronts of all of the homes were on Pennsylvania Street. By 1914, the Shara Teffila Synagogue and United Hebrew Congregation were established across Madison Avenue from the flats. Most of the larger homes were converted into duplexes by this time. To the north of the flats, the Industrial Training School had become Manual Training School, and the F.M. Spacke Machine Company was directly north of the flats. Southwest of the Madison was the Austin H. Brown Public School (P.S. No. 6). Things were relatively consistent around the Madison Flats into the 1950’s. Just to the west of the flats, the Manual Training High School had expanded and this area included a gym, assembly room, dining room, stage, and some school rooms. The Madison Flats were demolished quickly after the National Register for apartments was listed, most likely because it directly interfered with the Madison Street-Pennsylvania Street reconfiguration; the area is now a parking lot. The area became problematic for drivers in the late 1950’s. There were complaints about the Madison Avenue Expressway, due to the fact that one had to drive one and a half miles out of the way to turn south onto the expressway from east Morris Street (“Morris to Madison Turn a Dizzy One,” IndyNews, 9/25/1958). There were more complications with the intersection to the south once I-70 was constructed – a better road system was needed to handle all of the downtown traffic to I-70. Sometime after opening the McCarty and Illinois interchange in 1975, Madison Avenue and Pennsylvania Street were reconfigured, and Merrill Street does not go through entirely anymore in the area. 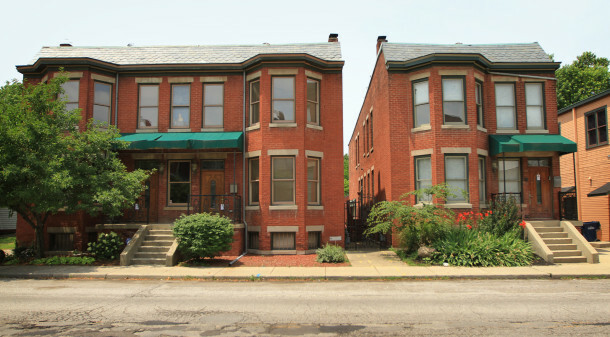 The Rafert Flats, at 1014-1020 North Alabama Street, were not included on the premise that it was “considerably altered by later in-fill brickwork in the doors and windows and by removal of its architectural cornices and moldings.” (NRHP Nomination Form, 1983) In 1887, the area of the future Rafert Flats was mostly an empty lot with only one single family home on the south end. The area was almost exclusively single family homes, some quite large and ornate. Not much had changed by the following decade, except another single family home was built just to the north on this empty lot. The apartments were built in 1908 by Christopher Rafert. In 1911, the apartments were described as “thoroughly modern flat, six rooms and a bath, hardwood floors throughout; private porch, front and rear; ample closet room; plenty of light” and went for $37/month (Advertisement, IndyStar, 3/13/1911). 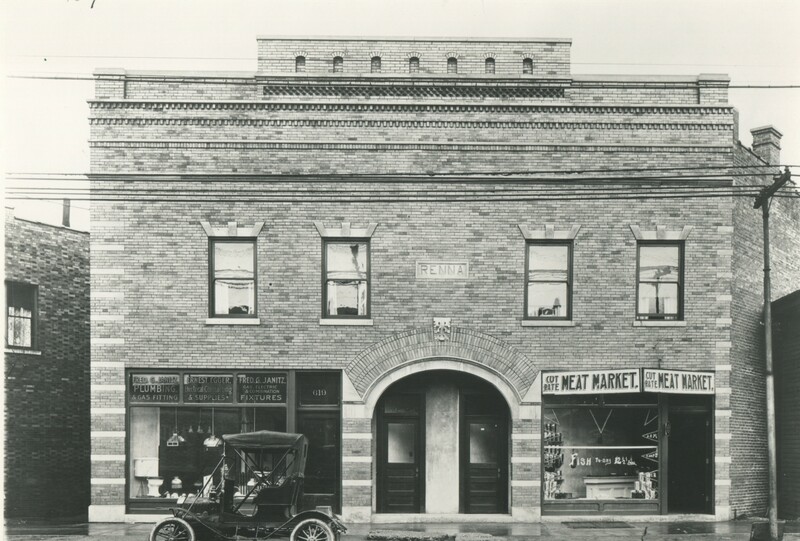 Smaller commercial businesses began creeping into the neighborhood around 1914, including one building just to the north of the Rafert Flats with five individual storefronts, including a drugstore and dry cleaning at the time. There was also a bakery just behind the flats. The flats were originally built as two separate buildings, one with an eastern-style flat plan and the other a single entrance. They were two stories with a bay window centering the front of each section. By 1950, there were a significant number of lots that were demolished to make room for apartments, such as the Graylynn Apartments at 1043-1051 Pennsylvania Street and the Delaware Flats at 1003-1015 Delaware Street. Sometime after this, the Rafert Flats were converted into 25 units, most likely single rooms with a shared bath. The two, two-story row houses faced in red brick look very similar to the Apollo-Aurora Apartments a block north, at 1101-1103 North Alabama Street. 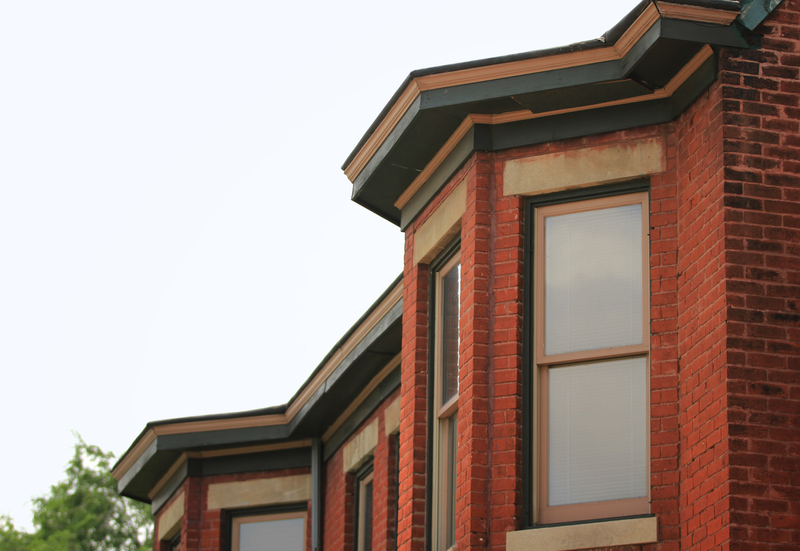 Row houses are rare for Indianapolis, which makes the connection between the Apollo-Aurora and the Rafert even more interesting. The Apollo-Aurora was originally called the Tuttle Terrace, named after original owners Frederick and Susie Tuttle. It was built 7 years prior to the Rafert, which leads one to believe Rafert was inspired by these unique row houses to construct a miniature version. 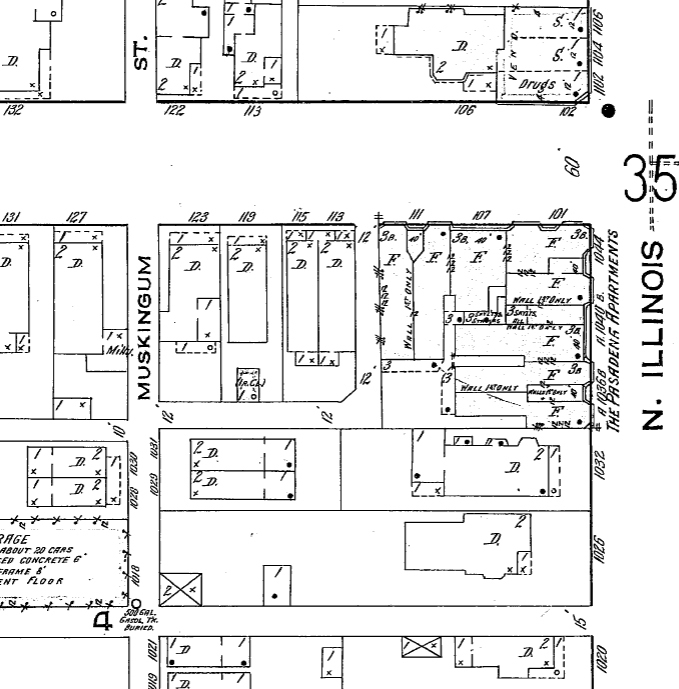 Rafert’s intentions were most likely to build according to the “growing need for moderate priced housing for downtown workers.” (St. Joseph Historic Area Plan, 1991) Rafert died in 1910 of pneumonia at age 71 in his home at 1115 North Delaware Street. 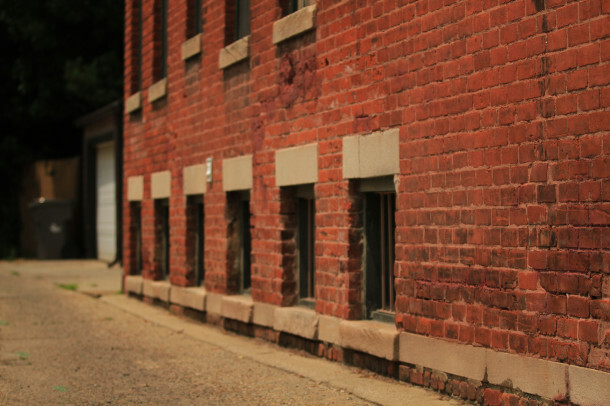 The brick and limestone building was owned by former mayor Steve Goldsmith’s father, Joseph Goldsmith, in the late 1980’s-early 1990’s. The building was involved in a lawsuit, which stated that Goldsmith had to repair the building in April of 1990; however, walls were not structurally sound and the property was not safely barricaded even months later (“A Showdown at Rafert Flats,” Bonnie Harris, IndyStar, 10/14/1991). Goldsmith had to file for bankruptcy and give up the structure, as he failed to make any repairs the following year. In 1993, Indiana Landmarks acquired the property (“Renovators Move into St. Joseph Area,” Derrick Stokes, IndyStar, 10/15/1993). During this time, the St. Joseph neighborhood was busy with renovating abandoned properties, converting some into condominiums, including the Rafert Flats soon after (“Building Diversity,” Peter Key, IndyStar, 10/17/1993). The Spink, also called the Moynahan and the Conquistador, was built at 234 East 9th (Pratt) Street in 1918. 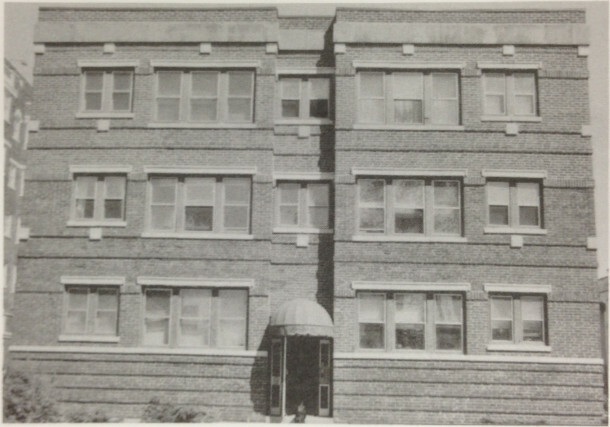 It was not included in the nomination because it “simply lacked the overall quality of architectural design and workmanship needed to be eligible.” (NRHP Nomination Form, 1983) In a very secluded area in the St. Joseph neighborhood, it contained up to 37 units over time. Due to the fact that many apartment buildings by the E.G. Spink Company were named “The Spink” at the time of their construction, the name was changed to the Moynahan Apartments by the early 1930’s. In the same general area as the Rafert, the area was mostly single family homes in the 1880’s-early 1910’s. The area felt a significant push for more apartments by 1914. 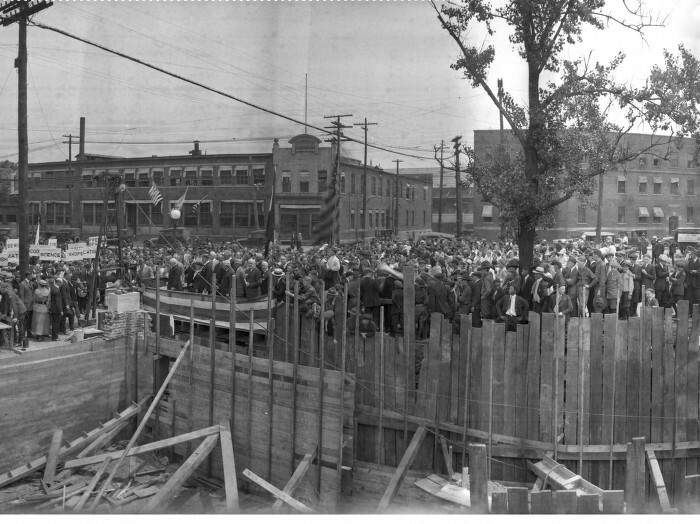 Most commercial businesses in this area were based off of nearby Fort Wayne Avenue. The Moynahan is three groupings of apartments with a large central hallway connecting and going through each building. There are three stories plus basement. It is directly across the street from Christian Place. The large Spink-Jefferson Apartment Hotel, now called the Renaissance Tower, was built in 1922 just to the west. By 1920, the E.G. Spink Company had erected 31 apartment buildings in the city. Mr. Spink stated that practicality was the appeal to apartments: “The idea was that there is a field in Indianapolis for small apartments that could be available for people of modest means. 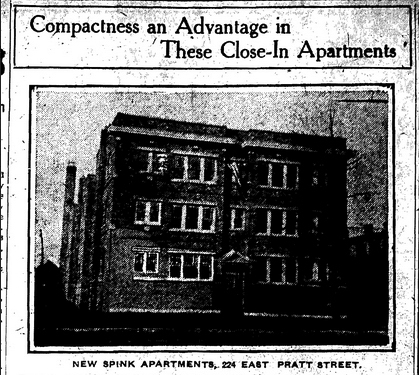 I found there was a real demand for two and three-room apartments that many families would rather do with less room in order to obtain the comforts of a modern apartment.” (“Spink Apartments Meet Heavy Demand,” IndyStar, 5/17/1920) From 1915 to 1918 alone, the Spink Company had erected 17 apartment buildings. The Moynahan was described as “36 apartments, each with a living room, a dressing room, a bathroom and a kitchenette. The kitchenette is fitted with an electric range… these new quarters are within easy walking distance of the business center and the Alabama car line is within a few feet of the building…” (“Compactness an Advantage in These Close-In Apartments,” IndyStar, 2/17/1918) It was renamed the Ninth Street Courts by the 1970’s. 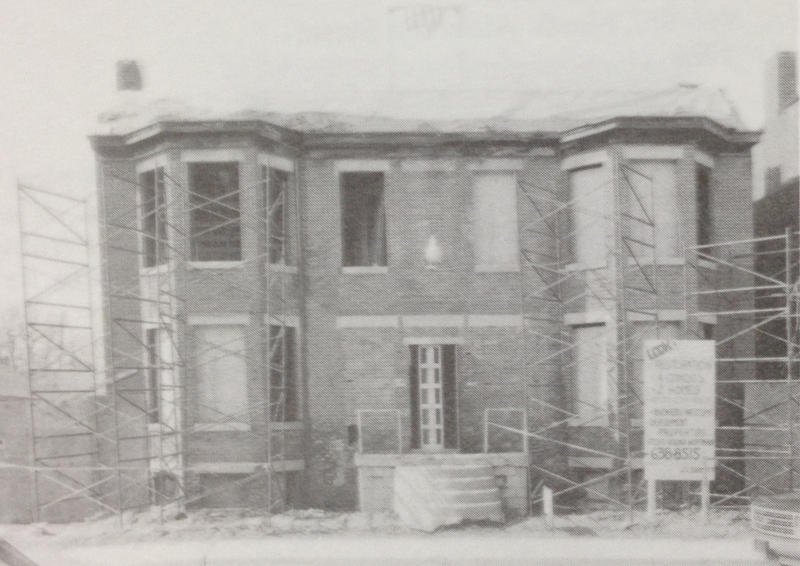 There are some brickwork and limestone accents that decorate the façade, as well as a recessed bay that contains the front entrance; however, the cornice has been lost (St. Joseph Historic Area Plan, 1991). The second to last building on the nomination list was recorded as 824 North Capitol Avenue. The 1898 Sanborn map shows no 824 Capitol Avenue – the houses go from 818 to 828. The Kahn Tailoring building is up before 1914, taking up the entire southeast corner of the block, as 802-824 Capitol, obviously with no apartment building existing here. 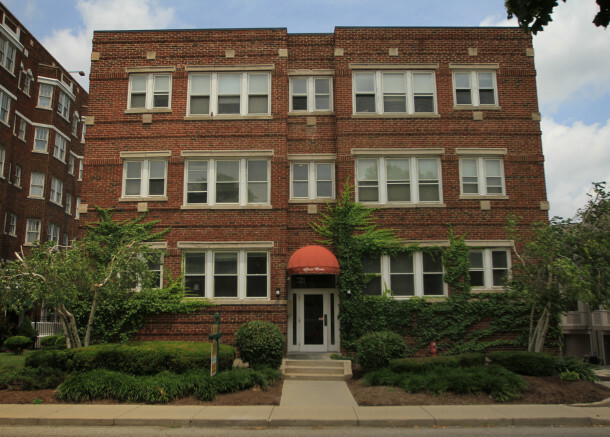 However, there is an 842 Capitol Avenue which is indeed an apartment building. The Griffith Flats, built in 1903, were excluded from the nomination because it “simply lacked the overall quality of architectural design and workmanship needed to be eligible.” (NRHP Nomination Form, 1983). The building is currently being renovated. Lastly, the Pasadena Flats were built in 1905 at 1036-1044 North Illinois Street and 105-111 West 11th Street. 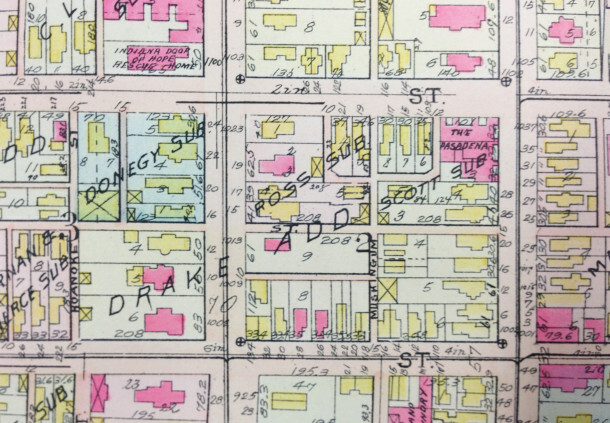 The area was filled with mostly larger single family dwellings in 1887. The lots were cleared for the future Pasadena by 1898. There were much larger homes to the north and many of the large homes to the south were split into duplexes by then. The building was sold quickly after construction was completed, from Oscar F. Mann to Walter J. Hubbard. The sale also included part of the Scott Subdivision and Drake’s Addition just to the west of the apartments, totaling $75,000 (“Pasadena Apartments Sold,” IndyStar, 4/15/1905). Oscar F. Mann was involved in a great deal of Indianapolis real estate in the early 1900’s-1915 in all parts of downtown. His wife Henrietta was also individually listed for many real estate transfers in the city. Walter Hubbard was even more prolific in the transfer of real estate, including deals with Butler University. Hubbard and his wife lived at 2244 North Meridian Street. In 1912, Margaret Bolyn, the granddaughter of the prominent Indiana Supreme Court justice, Jeremiah Sullivan, who proposed the name “Indianapolis” for the new state capital, died in the Pasadena Flats (“Mrs. Margaret Bolyn, 52, Teacher for Deaf, Dead,” IndyStar, 7/9/1912). She was a teacher in the vocal department for the Indiana State School for the Deaf. 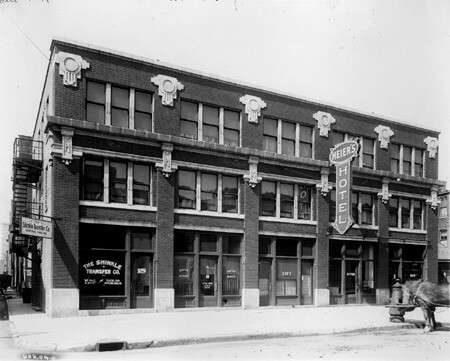 By 1914, there were additional apartment buildings in the area, such as the Lexington Apartments and also more businesses, like the Stutz Motor Car Company. The flats were three stories plus basement, with twelve foot ceilings. They were mostly divided into eastern style flats, with four bays on each side. By 1950, almost all homes in the area were demolished for businesses and garages. Near the Pasadena there was the Standard Oil Company office, plumbing shop, used auto business, American Linen Supply Company, a dry cleaner, and a printing press. The Pasadena Flats were demolished in 1988. While it had survived the I-65 construction just by a half block, it did not survive the 10th Street widening project and the construction of a twelve story building directly southeast of the building. Without any protections, it was quickly demolished to make room for additional parking. That building is currently inhabited by Indiana University Health. Another large building at 1099 North Meridian, built in 1984, caused a high demand for parking, which may have attributed as well. I lived at the Spink at 234 East 9th Street from 1991-1993. My apartment (on the top floor) was a two-bedroom with a living room, bathroom and eat-in kitchen. Also had a furnace/airconditioning unit in the hall closet. Aside from the door to the apartment, it had been modernized and didn’t really have any significant architectural details left in it. The bathroom and kitchen were new. I do recall that the entry hall to the building still had some of the original look. There was a laundry room and storage space in the basement. Overall I enjoyed living there, except that the roof developed some leaks the second year. 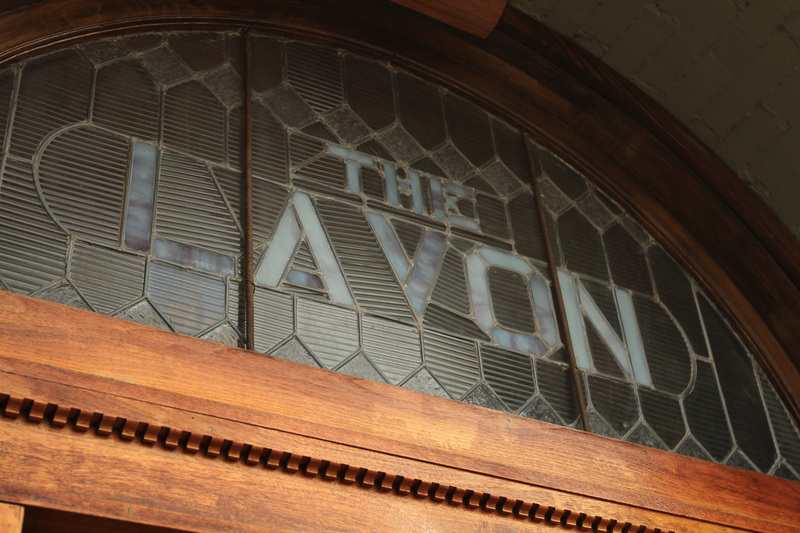 I also remember drawing the front of the building for the owner to use on his letterhead. At that time the neighborhood was still fairly dangerous, with strong-arm robberies from time to time. The three old houses across the street were all abandoned and badly deteriorated too. The Spink caught fire a couple of years after I was there and a lot of the room was damaged. It’s nice to see that they’re back in good shape (as far as I can tell from the photo).